Good old Eddie Hearn has been involved in a number of funny boxing clips in 2017, but this one may take the pie for the British boxing promoter. 2017 was a big year for Hearn and his stable of fighters. Perhaps the biggest moment came when Anthony Joshua stopped Wladimir Klitschko inside the distance in front of 90,000 screaming fans at Wembley stadium. A feat not seen before World War II, to get 90,000 fans to attend a boxing match in the competitive sports landscape we live in testament to just how big a star Anthony Joshua has become. 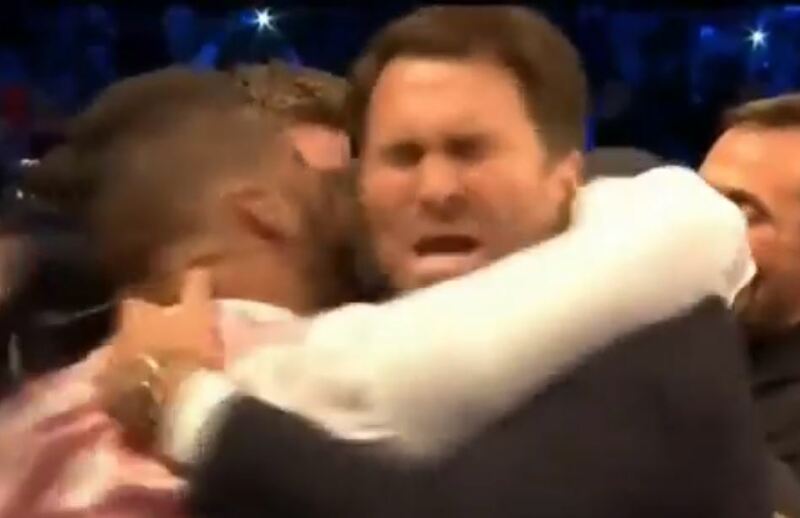 Good old Eddie Hearn went wild in celebration, understandably. As did Hearn signed fighter and Liverpool heavyweight Tony Bellew. A real connection there. Hearn took it well to be fair. A once amateur fighter in his younger days despite the silver spoon jibes his rivals level at him, knows the feeling at least of taking a smack on the head. As for Bellew, he now awaits a rematch with David Haye next May at the 02 Arena in London after beating Haye first time round inside the distance last year.